For most of the 1948 campaign season, the only person who believed Harry Truman could win an elected term was Harry himself. The politicians, the punditry, if not the entire country, thought poor Harry--who was not now and never would be FDR--was laughably unelectable. Not a chance in hell. It was going to be so easy. "Truman is a gone goose", said Congresswoman Clare Boothe Luce, the lovely blond lawmaker from Connecticut, and although Democrats flinched, no one contradicted her. Since the Republican sweep of the off-year elections in November, 1946, every public opinion poll, every survey of political experts had spoken with one voice: If Harry Truman ran for the presidency, he would be doomed. Gallup reported that between October 1947 and March 1948 the percentage of Americans who thought the President was dong a good job had dropped sharply--to 36 percent--and that if he ran then we would lose to Dewey, Stassen, MacArthur or Vandenberg. "If Truman is nominated," Joseph and Stewart Alsop told their readers, "he will be forced to wage the loneliest campaign in recent history." Even he had misgivings. . .he asked Secretary of the Army Kenneth C. Royall to tell the general that if Ike would run for President on the Democratic ticket, Truman would be proud to be his running mate. Eisenhower asked Royall to convey his heartfelt gratitude to the President, but with it his regrets. Possibly he thought that with Truman as his vice-presidential nominee he would lose." Almost immediately after Truman announced he was going to run, on March 9, 1948, most of the party's leaders demanded that he withdraw. The Bronx boss, Ed Flynn, refused to appear on the same platform with him and he literally had to be strong-armed into his seat. People who should have been by his side snubbed him. A planned meeting of wealthy Democrats--potential supporters--had to be cancelled when only three of them agreed to show up. When Truman's name was mentioned at a Los Angeles rally the speaker was booed. So they were left with Truman. The Republicans and the press were having a field day, but what nobody knew was that Truman's aides had finally convinced him that he had to play the underdog and go on the attack. Truman hated PR and gimmicks and anything else that smacked of phony posturing, but he knew how to get mad. According to Manchester, the brilliance of his campaign from then on was that Truman was throwing out his canned speeches--he never could read them without sounding wooden and insincere--and replacing them with plain Missouri talk. After a couple of successful off-the-cuff speeches to small groups, his aides started thinking big. Someone came up with idea of taking the Presidential train across country to go stumping. Truman dipped into his $30,000 travel allowance--clearly unethical in any sense of the word but ignored by the Republicans, who saw it as a quaint trip to nowhere--and used it to campaign in as many whistle-stops as he could manage in two weeks. By the time he got back to Washington he had covered 9,500 miles and had delivered 73 speeches in 16 states. He followed Clark Clifford's advice: "Be controversial as hell." He got the crowds riled and he liked what he saw. They were with him. "Give 'em hell, Harry!" got its start on that trip when someone in the crowd shouted it out, and he was wily enough to keep it going. The Washington press corp, following him, had to admit "the President had almost made [us] forget that he didn't have a chance." But it was back to humiliation again in Washington when he found his own party still working feverishly to find someone to take his place. Almost to the last minute he couldn't find anyone to run with him as vice president, until finally Alben Barkley said he would do it. So on July 14, the night of the Convention, Truman found himself in a small, dank room under the platform with a balcony overlooking an alley, trains shaking the walls as they thundered by. He waited there for more than four hours, as the nominating speeches and voting went on above him. It was nearly 2 AM before he was finally allowed to give his acceptance speech. I can only guess that spending four hours nearly alone in that empty, smelly, noisy room made him mad. When Alben Barkley was nominated by acclamation but he, Truman, had to share the votes with others, that must have made him mad. That nobody in that hall thought he had a chance in hell to win must have made him mad. Whatever the reasons, Harry Truman gave the speech of his political life and got those people up on their feet. In the middle of the night, when it was over, Convention Hall rocked with the sounds of a standing ovation. I accept the nomination. And I want to thank this convention for its unanimous nomination of my good friend and colleague, Senator Barkley of Kentucky. He's a great man, and a great public servant. Senator Barkley and I will win this election and make these Republicans like it -- don't you forget that. We'll do that because they are wrong and we are right, and I'll prove it to you in just a few minutes. "Much that Truman said was absurd or irresponsible and some of it mischievous. Harried and forlorn, supported by only 15 percent of the nation's newspapers, told on every side that he was wasting his time and everyone else's, he was capable of delivering demagogic lines. "The Republicans," he said, "have begun to nail the American consumer to the spikes of greed." He called them "gluttons of privilege," called Dewey a "fascist" and compared him to Hitler, and to over 80,000 listeners at the National Plowing Contest in Dexter, Iowa, he charged that "This Republican Congress has already stuck a pitchfork in the farmer's back." You know the outcome. You know that every prognosticator gave Dewey the win. 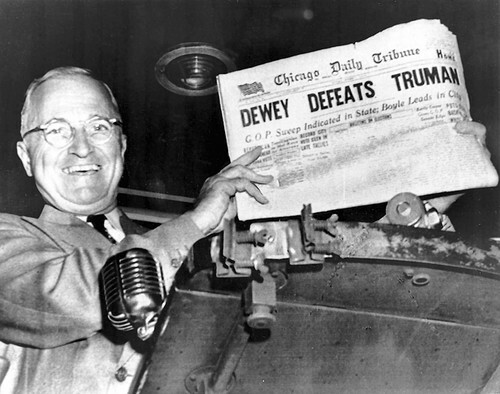 The Chicago Tribune wasn't the only news outlet to write their "Dewey Wins" leads ahead of time. When Truman got back to Washington, he passed a huge sign across the front of the Washington Post building that read, "Mr. President, we are ready to eat crow whenever you are ready to serve it." Manchester writes: "In a letter to his own paper, Reston of the Times wrote that 'we were too isolated with other reporters and we, too, were far too impressed by the tidy statistics of the poll.' Time said the press had 'delegated its journalist's job to the polls.' Several angry publishers canceled their subscriptions to the polls. The pollsters themselves were prostrate. Gallup said simply, 'I don't know what happened.'" What happened was that Truman didn't give up, he didn't compromise and he didn't conciliate. He went on the attack against the Republican-held 80th congress and whipped them to death with their own deeds (or non-deeds, as the case may be. The highlights of his stump speeches were his tirades against the "do-nothing Congress", and it worked. Along with Truman's victory, the Democrats took the majority in both houses). One final footnote: After the election, the Survey Research Center of the University of Michigan conducted a poll of the polls and found that two weeks before the election a full 14 percent of the Truman voters hadn't yet made up their minds. Both Roper and Gallup did their own after-election research and found much the same conclusion: One voter in seven made up his or her mind within two weeks of the election. So, as Manchester points out, "Using either the Michigan figures or Gallup-Roper's, one finds that some 3,300,000 fence-sitters determined the outcome of the race in its closing days--when Dewey's instincts were urging him to adopt Truman's hell-for-leather style and slug it out with him, and when he didn't because all the experts told him he shouldn't." Is there something to be learned from this? I don't know. It's a different president, a different time and a different Democratic Party. What I do know as I'm writing this is that Mitch McConnell's speech before the Heritage Foundation is being played over and over again--the one where he says loud and clear, "we'll cooperate with you, Mr. President, when you give us everything we want". In the background, in my head, I'm hearing our president's post-election speech--the one where he still thinks the answer is to make nice with those vicious megalomaniacs--and I want Give 'em Hell Harry to grab Obama the Oblivious by the scruff of his neck and whap him one upside the head. If anyone could do it, Harry could. Harry was no angel; he was a politician, for god's sake--but he knew how to spot incorrigible rogues, and he knew how to destroy them with the truth. I doubt he stayed awake nights wondering if he was liked. President Obama can't quite see the challenge in taking on his most relentless enemies. He's supposed to be working against them. They're supposed to hate him. He's supposed to be a Democrat and he's supposed to remember what that means. There's an employee handbook out there somewhere for Democrats but this new bunch refuses to read it. It says right on page 1, paragraph 2, they can be fired for that. I agree wholeheartedly with Nedra, Ramona. You can DO it! You should at the very least forward this to the President as well as to his Chief of Staff. Please do this, for me! Truman had some great lines. It's the People who matter, not the Republican Party. I just adore Obama! But maybe it's time for some Lyndon Johnson style swearing and peeing in the bathroom off the Oval Office with the door wide open. Especially in front of Boehner and Droopy. Yeah, that's the ticket, grab Droppy by the ears andshow him who's President. Thanks so much, Nedra and Lefty. You made me laugh! There are hundreds of people writing the same sort of stuff this week, but I doubt the president is taking the time to read it all! But I appreciate your confidence. Lefty, I've tried to send my blogs to the White House but they have a policy of not opening links, so no luck there. I guess I could send it snail mail, but I know I'd get one of those damned canned responses, so why bother? Just wanted to apologize for the mixup with that last paragraph. I don't know how it jumped out of the speech and ended up at the bottom, but I've fixed it now. Hope it wasn't too confusing. Don't discount the power of Twitter, Ramona. We need to get this in the face of more than one Dem politician and some, a few, maybe a staffer will read it and go, 'Hey boss...maybe you ought to read this'. That's what happens. Or maybe we start giving those speeches at local Dem meetings, then regional Dem meetings and if lucky at the state meetings. It's not only the bully pulpit of the nation but the bully pulpit of the Internet that can be used. We have the organizations that have the money to run the 15 second ad that says, "It's time to give 'em hell, Mr. President. Harry Truman spoke the truth and they thought it was hell. Do it everyday. Call their bluffs. Stand and fight, Mr President.It's what Democrats do." That does time out at 15 seconds and could use more wordsmithing. But you can get the gist of the intent. They are on Twitter as well. You sure it a vein with me. I posted earlier, "Think Dem's have learned about Practical Politics? Stop taking a pillow to a gunfight." Sending that around the Hivemind and you'll find people that want to hear that concept. If 501c4's are the new fundraising gimmick, then we go for it. If lies and innuendo are the topic of the day, we fight back with as much free media as possible then run paid media calling them liars. And we better have the exact facts and figures triple fact check by fine researchers and writers like you. I wrote my own version of a Democratic Manifesto at my primary blog http://stuartoneill.com . Find it and you'll know where I'm at for the next two years. There's nothing in there that won't cause a fight. When the GOP constantly stands in the way of things people want they will ruin their own credibiltiy in two years time. That can only happen if we are shoving good, solid jobs programs down their throats. Read my piece, tie it together with money to be spend NOW on political ads every time a lie comes up, mix in a healthy, righteous dose of populist anger and there's a 24 month campaign for the hearts and minds of the American people. Thanks so much, Stuart, I'll be sure and read your posts.